Scroll down the Advocacy page to find a number of way you can turn your frustration into positive action for change! Click the Ribbon! Click the Ribbon to be taken to a link of Banks that DO NOT accept the fraudulent Mexican Matricula Consular ID! Pour money in banks that DON'T accept the MMC! US Senator Brown's web site here. Let the senator know that you oppose comprehensive immigration reform (amnesty)! STOP THE U.S. SENATE FROM GIVING AWAY YOUR JOB AND TAX DOLLARS! Call your Senators at their D.C. and home district offices today! 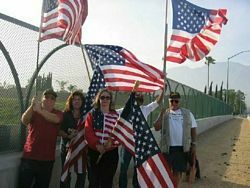 Why should Americans be taxed to pay for illegal aliens who break our laws, burn our flag, displace US workers, and protest for more money, benefits, and services? While 80+ % percent of Americans' want illegal immigration stopped, and our borders secure, the US Senate plans to pass a guest-worker amnesty bill. It is important for all Ohioans to immediately call Ohio's Senators' Sherrod Brown and Voinovich at their DC and District offices (link to phone numbers below). If you live out-of-state, contact your state's US Senators. 1. You strongly oppose any legislation that proposes any type of amnesty schemes (i.e., so-called comprehensive immigration reform or guest-worker programs) for illegal aliens. Click here for Senators' DC and District office phone numbers! Feeling insecure about US border security? Write Letters to the Editor! Write letters! Write letters to newspaper editors and copy and send to your public officials! One published letter can educate and influence thousands of people! Complain via your stock shares! If you own stock (or have a 401K) in a company that aids illegal aliens, contact the company or your mutual fund manager to complain. As a stockholder, you may also have the right to speak at stock-holders' meetings. Want to participate in an American worker rally in Akron, Athens, Cleveland, Columbus, Cincinnati, Dayton, Toledo? Contact OJJPAC and we'll let you know about planned rallies in Ohio. 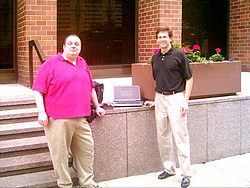 Do you know of an Ohio company that hires illegal aliens? Have you lost your job or had your wages reduced due to illegal labor hiring practices? Click on the "AlienBuster!" link and tell us your story. AlienBuster! Want to help fight political corruption in Ohio? Know of a public official or public employee involved in criminal activity? Click on the "CorruptionBuster!" link and tell us your story. 6-28-07 VICTORY: CLOTURE ON AMNESTY VOTED DOWN IN U.S. SENATE! NO AMNESTY! THE RULE OF LAW AND COMMON SENSE ARE AT LEAST TEMPORARILY PRESERVED. OJJPAC.org's sincere thanks to the thousands of reader volunteers across Ohio and the U.S. who made this possible. (Not to mention our other friends in this battle who fought so tirelessly and were critical to Thursday's victory!) Editorial coming soon. Story and photo gallery here! 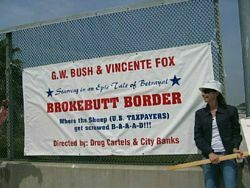 On March 5th, Minutemen progressives did the job President Bush refuses to do -- Secure the US border and prevent illegal entry of suspected drug smugglers and terrorists at the US and Mexican border near Campo, CA. 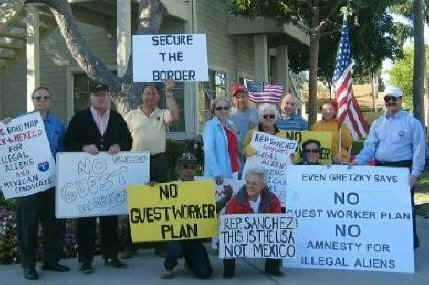 No Guest-Worker Scam Rally at Sanchez's office! Lake Forest Day Labor Site Protest Stops the Hiring of Illegals! Lake Forest Day Labor Protest! American Civil Rights Activists at work in California! What's more American than a good group of average working Americans taking time out of their busy day to tell their Congressman what's on their mind! 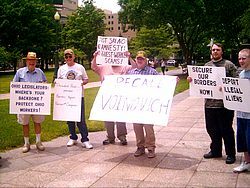 Here are some voters who are tired of professional lobbyists trying to push an illegal alien amnesty or sham guest-worker program through Congress. Americans are tired of seeing neighbors lose their jobs to illegals aliens. It's time more American citizens step away from their televisions and video games and stand up for their fellow citizens' rights. Candlelight Shines on US Sen. Feinstein during Successful Vigil! Peace activists recently held a candlelight vigil outside US Senator Diane Feinstein's office. Over one hundred Californians gathered at Senator Feinstein's office to shine some light on her past support for illegal aliens. The community activists want Senator Feinstein to support HR 4437 and vote against any Senate plans to pass an amnesty/guest-worker bill. For more details and photos, click here: Candlelight Vigil! Wells Fargo Protest: $30,000 of Stock Sold/Accounts Closed! The Wells Fargo Bank protest was a great success. Citizens sold their Wells Fargo stock and closed their bank accounts in protest of Wells Fargo's giving accepting fraudulent ID's and giving home loans to illegal aliens. What part of "illegal" does Well Fargo not understand? Click here for more details and photos: Wells Fargo Protest Results! The 21st Century Paul Revere Riders' Rally at the Ohio State House in Columbus! 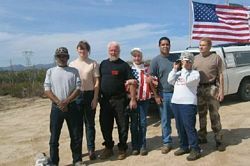 In a summer-long cross-country motorcycle ride, American civil rights activists visited state capitols across America to bring attention to the illegal immigration crisis in the United States. 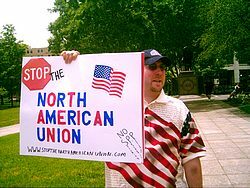 The group, called the Paul Revere Riders, held a rally at the Ohio State House in Columbus July 30th. SEARS sells Aztlan pride T-shirts. While Aztlanders are plotting the takeover of US territory, Sears seems to think it's a good idea to sell Aztlan T-shirts to them and their supporters. I wouldn't have believed it until I saw the T-shirts myself (after it was brought to my attention by an angry American). Click here to see T-shirt. It is by the Poncho Villa T and Mexican pride T they also sell. UPDATE: 12-21-06 Due to negative publicity, Sears has pulled the anti-American Aztland T-Shirts. The link above now only takes you where the T-Shirt used to be advertised. OJJPAC thanks our readers for complaining to Sears about selling anti-American products.